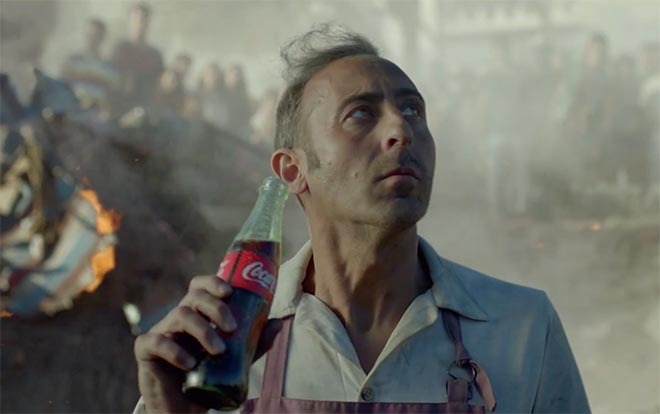 Coca Cola’s centenary of the Coke bottle includes “A Generous World”, a commercial launched during the Academy Awards. 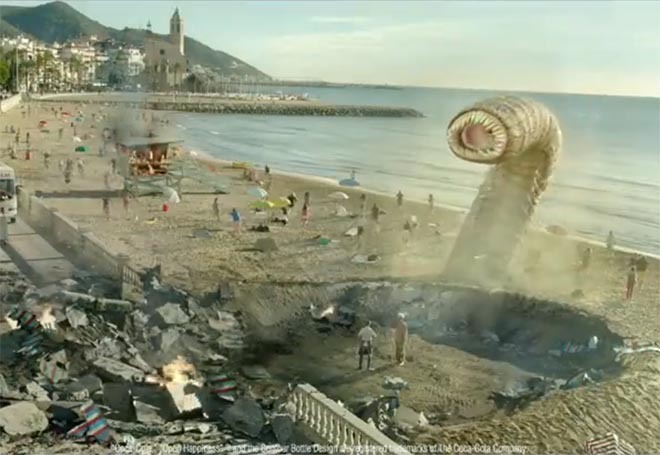 The commercial shows a full bottle of Coke being handed from survivor to survivor in calamitous scenes on Sitges Beach in Spain. “No matter who you are, or whatever life throws at you, there’s always someone out there who could use a Coke a little more than you. Who would you share one with?” The teaser version ended before viewers could see what was casting a large shadow on the earth. The Coca Cola USA Facebook page invited fans to channel their inner screenwriters to suggest who they thought would get the next Coke, using #AndTheCokeGoesTo. The amended ending was posted on the Facebook Videos page. Filming was shot by director Dante Ariola via MJZ with producer Jennifer Hundis, director of photography Philippe Le Sourd, head of production Scott Howard, line producer Natalie Hill. Editor was Adam Pertofsky at Rock Paper Scissors with assistant editor Marjorie Sacks, post producer Shada Shariatzadeh, executive producer Angela Dorian. Post production was done at The Mill by executive visual effects producer Chris Harlowe. Colourist was Stefan Sonnenfeld at Company 3. Sound was produced at Eleven Sound by Jeff Payne. Music, Jackie DeShannon’s 1969 hit “Put A Little Love in Your Heart”, was produced at Walker Music by executive producer Sara Matarazzo.